All over America, at this very moment, people are peeling, chopping, roasting and baking, busily preparing traditional Thanksgiving meals. But one person in Brooklyn is seeking an alternative to expending all that time, effort and money via a Freecycle Thanksgiving. Freecycle, if you are not familiar with it, is a simple, rather noble concept: those who have things they can’t use give them freely, as gifts, to those who need them. The object is to reduce waste, save valuable resources and ease the burden on landfills. 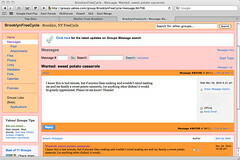 Freecycle members contact each other online using message boards operated by the Freecycle Network. While most members post messages describing the items they want to give away, a few request items they want but don’t have. This “wanted” listing, posted the evening before Thanksgiving, struck me as particularly ambitious and audacious, and I can’t help wondering what type of response it will generate. In any case, however you choose to celebrate the day, I wish you a happy Thanksgiving. Today, as I emerged from the Clark Street subway station onto Henry Street, my eye was drawn to a bright spot of color beyond the doors. 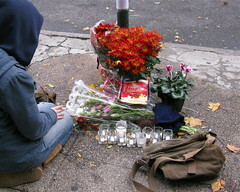 Moving closer, I saw that the vibrant hues were actually candles and bouquets placed on the sidewalk. The location, just outside a college dormitory, is a stop for a private bus that shuttles students from their Brooklyn residence to Manhattan. Feeling dread, I approached the man working in the coffee stand adjacent to the spot and asked whether he knew anything about the flowers. 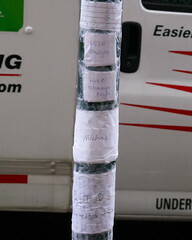 Sadly, he told me that early yesterday morning a student had committed suicide; he’d leapt from an eighth-floor window. “My boss,” the man said, “was here when it happened. 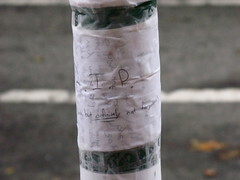 He didn’t see the boy fall, but he heard him hit the sidewalk.” He pointed out that the pole of the bus stop was covered with handwritten notes carefully taped to the steel. 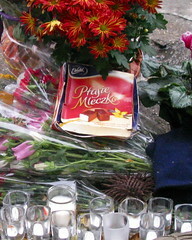 As we spoke, a young woman came out of the building and knelt at the makeshift memorial, arranging a box of sweets among the flowers. The boy who fell, she said, was a close friend, only 19 years old. He jumped to the cold, dark street at 2:15 a.m. I later read more about the tragic death in the newspaper, including the name of the young man who died, Michael Simmons. He was a talented actor who had recently arrived from Tempe, Arizona to study at the New York Conservatory for Dramatic Arts. My heart goes out to his friends and family. 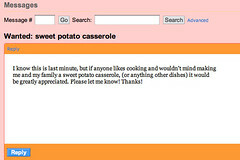 You are currently browsing the Blather From Brooklyn blog archives for November, 2010.